Manage the resource capability and work load more efficiently with the visual resources overview. It integrates both project work packages from InLoox PM and appointments from the Microsoft Exchange free/busy service. This way, you always have an instant and complete overview of all project resources – be it team members, rooms, or tools. Click Resources in the lower left corner of the home page. The resource overview loads all resources system-wide. Define time frames On the Start tab, in the Date Range group, choose Start and End date. All resources that are not occupied during the defined period are hidden. Zoom to fit Click Zoom to fit in the View group to adjust the date interval of the view. Refresh Use the Refresh button to update all changes and reload the view. This button can be found on the Start tab in the View group. 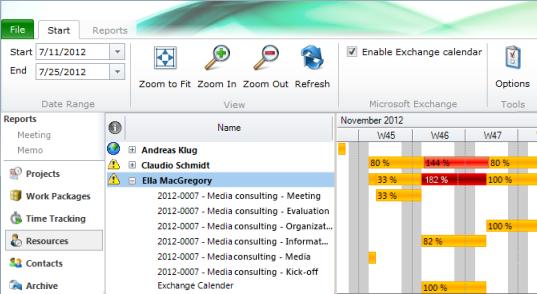 Show exchange calendar In the Microsoft Exchange group, click Enable Exchange calendar. This option displays or hides the information of the Free/Busy feature of Microsoft Exchange Server. InLoox PM Web App takes account of the Exchange Server calendar information when calculating the workload, if this option is activated. Add the appointments from the Outlook clendar via InLoox PM options. Open the options and click Exchange Server in the navigation pane. Then type a domain with contact in the Exchange Server area. Open InLoox PM options Click Options in the InLoox PM Options group. Here you can change the basic settings for InLoox PM. Information from the free/busy-feature of Microsoft Exchange Server cannot be opened: at any time for any time period for external resources. The context menu provides you with the features to adjust the view that can also be found on the InLoox PM Web App Ribbon, namely Zoom In or Zoom Out, Zoom to fit and Refresh. Right-click in the resource list or the workload chart to open the context menu. Work with resources - InLoox • Copyright 1999-2019 © InLoox GmbH. Reservados todos los derechos.